Benjamin was born in 1886 in Eastville, a northern suburb of Bristol, the fourth son of James Bushnell and his wife Julia née Mallett. The family led an itinerant life: James and Julia married in Londonderry, Ireland, then had children in Ireland (Mary Ann born 1875), Alderney (James C 1876) and Malta (Alfred Charles 1879) before settling for a while in the Bristol area (John Francis William 1882, Lillian Alice May 1885, Benjamin 1886, Henrietta Mabel 1887, William 1889). The last of these, William, died soon after his birth. The explanation for their early travels is that James was serving in the Army, indeed, Julia herself was an Army child having been born in Maker Heights, the Naploeonic army barracks at Plymouth. James attested with the 61st Foot in November 1862 and served for 24 years, ending his army career in as a Staff Sergeant. Following the death of the infant William in 1899 Julia disappears from the family group, the obvious thought is that she died as a result of William’s birth, but her death is not registered at that date. Whatever the cause of Julia’s departure James evidently decided to return to his roots and moved the family moved to Clifton Villas, Newbury, where James found employment as an assurance agent. His sister Mary Ellen was added to the family group as house keeper. Ten years later, in 1901, the family were resident in Hamstead Marshall where James was working as a cobbler; four more young children, nephew and nieces, had been added to the household. At this date (1901) Benjamin was an unemployed 14 year-old, evidently his prospects were not bright locally so, given his father’s background, it is not surprising that he looked to the Army for a solution. He enlisted with the Royal Berkshire Regiment in 1903 and served with the 2nd Battalion in India. However, he was not among the select group chosen to represent the regiment at the Delhi Durbar in 1911, when the coronation of King George V was marked with a lavish ceremony and a proclamation of the King as Emperor of India. Benjamin returned to civilian life, probably in 1912 after nine years in uniform (two as a boy soldier and seven as a regular). However, his commitment to serve was not over, he would remain a reservist for a further 5 years. In 1914 he married Florence Annie Sturgess in Newbury. When war was declared he would, as a reserve, have received his mobilisation papers ordering him to report for duty. He evidently did not rush to join the regiment as he was not one of the 138 reservists with the 1st Battalion when it left Aldershot en route to France in mid August. However, it was not long before he crossed the Channel, landing in France on 20 September. He probably caught up with the battalion in the field on 5 October as one of 125 privates, 1 corporal, 2 sergeants and a 2nd Lieutenant who arrived that day to help make up for the battalions losses since they first encountered the enemy in late August. At this stage of the war the British Expeditionary Force (BEF) was struggling to cover its segment of what was rapidly becoming the infamous trench line of the Western Front. Men had to spend long periods in the firing line or close behind in support positions – all the time within the range of the enemy’s artillery. After over a month of action, fighting, retreating, fighting, advancing, fighting, the battalion that Benjamin joined was exhausted, out of the line for the first time since the fighting began. However, shortage of men meant they were soon back in the line and the war went on. By 1916 the BEF had grown into a huge force, many times its size in 1914, and was covering a far larger proportion of the line the British sector running from the North Sea to the Somme. Life in general was easier for the infantry than in 1914, there were enough men to allow for the rotation of troops in and out of the front line and for them to spend far less time in the line than they spent in safe billets out of the range of the enemy artillery. All of which made life easier – until it was time to go ‘over the top’, when life suddenly got a lot harder, and, all too often, shorter. CARENCY: The party of 100 under Captain WEST which had been withdrawn from the line on the 24th returned at 5pm. This party was to make a raid on the German front line at 11.30pm. (Battalion orders and instructions are attached. ), the plan being to make a frontal attack in two waves with 2 officers and 56 other ranks simultaneously with bombing attacks on both flanks along the communication trenches which led into the enemy line. The cutting of their wire had apparently put the Germans on the alert for on the signal being given to advance, a very heavy trench mortar, bombing and machine gun fire was opened and prevented any of our parties reaching their objectives. Casualties in the raiding party were Lieut THORNE missing, Sec Lieut JACKSON wounded, 4 OR’s killed, 1 missing and 21 wounded. Total casualties in the Battn during raid 2 Officers 43 OR’s wounded, killed and missing. BUSHNELL - 7545, Pte B Bushnell, 1st Royal Berks Regt, killed in action on the 26th of June, fourth son of James Bushnell, Crockham Heath, near Newbury, Berks. Pte B Bushnell, who was killed in action on June 26th, was the fourth son of Mr James Bushnell, of Crockham Heath. He joined the Royal Berks in 1903, and had thirteen years’ service to his credit. He rejoined at the outbreak of war, and was sent out with the Expeditionary Force to France. He was wounded in the left eye in January, 1915, and returned to duty in April. In January, 1916, he suffered with a poisoned arm, but went back to duty in April. He never returned. His wife received letters from the lieutenant of his Company describing how he met his death. He was returning to the trenches when the Germans began shelling. He and two others made for their dug-out, but immediately on reaching it a shell burst, and all three were buried. They were extricated as quickly as possible, but death had been instantaneous. Several relatives are on service, and other casualties have caused sorrow. Benjamin's headstone flanked by two others - between them marking the final resting place of nine comrades. It sounds as if he was a member of the raiding party returning to the trenches after failing to reach the enemy line. 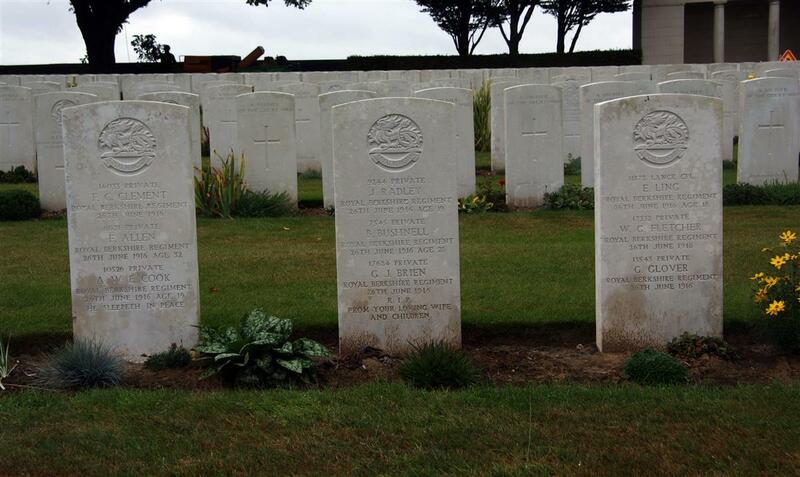 The battalion lost 17 men that day, nine of whom were buried in Cabaret-Rouge Cemetery, so it is not possible to be sure of the names of the two mates who were buried alongside Benjamin when the fatal shell burst. The bodies of the remaining eight casualties were never identified, their names are remembered on the Arras Memorial. Benjamin’s grave is a multiple one, with two other occupants: G J Brien and J Radley marked on the headstone. Either side of this grave are two more headstones holding the names of three more members of the 1st Royal Berks who died on 26 June. The nine names are recorded by the Commonwealth War Graves Commission as buried in the same grave - I. A. 5/16 – a sure sign of a mass grave. The other six names: F Allen, FC Clement, AE Cook, WG Fletcher, G Glover and E Ling include that of Frederick Allen from Bishop’s Green, a hamlet just over the Hampshire border from Newbury, another old regular. If a common background was grounds for friendship Frederick could well have been a particular mate of Benjamin’s. 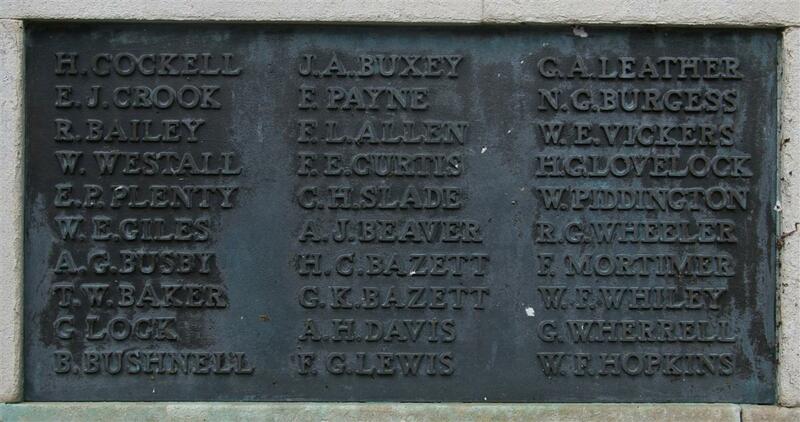 Locally Benjamin is remembered on Tablet 9 of the Newbury Town War Memorial.